When living a Primal lifestyle you have two options when it comes to breakfast. You can either skip it if you’re intermittent fasting or you can start the day with a Primal friendly breakfast that’s high in fats and protein and will leave you feeling full and ready to tackle the day ahead. Personally when it comes to breakfast I tend to skip it (unless it’s the weekend and I’m with my family) and eat a little later on in the day when my body really starts to rely on food as energy. Believe it or, breakfast isn’t the most important meal of the day and more times than often, we’re only eating because we think we should and most of the time we’re consuming sugary breakfast cereals and low-fat yoghurts where the fat is replaced with sugar. When you’re indulging in those kind of breakfasts, it really is a recipe for disaster. So next time you wake at 6am, ask yourself if you’re actually really hungry or whether it’s just your brain telling you that you need fuel because it’s morning time. Did you know that any sugar consumed within the first couple of hours of waking causes the body to create an even bigger insulin spike than normal? This of course can be really harmful for our bodies, especially for those who struggle with type 2 diabetes – which is why it’s important to fill your body with the right food in the mornings. Have you ever stopped and thought about where breakfast get it’s name? It is named after its function – it breaks the fast. If you are indeed a breakfast person then my Primal protein açai chia parfait will be the perfect recipe for you. However, saying that, have you also tried my four ingredient protein pancakes? This recipe is everything a weekday breakfast needs to be. It’s quick, it’s effortless, it’s light yet delicious and it’s provides our body with essential healthy fats and protein that will keep us full until lunchtime. In this recipe I’ve used the powder of a recently popular superfood berry – açai. You can find the berries on açai palm trees in the middle of South American rainforests. They look a mix between a grape and a blueberry. The seed itself takes up about 80% of the berry and the flesh and skin contain tons of vitamins and nutrients. One cup of açai berries contains only 70 calories and 4g of healthy fats. Calorie wise, açai berries have roughly 10 calories less than blueberries so they’re definitely on my superfood berry list. Açai berries are also high in fibre, calcium, antioxidants and can help reduce the risk of cancer, heart disease and combat high cholesterol levels. Ideally when it comes to chia pudding it’s best to prepare the night before for a thicker texture – don’t worry though, you’ll only need 2 minutes to prep the chia pudding and it’s done. 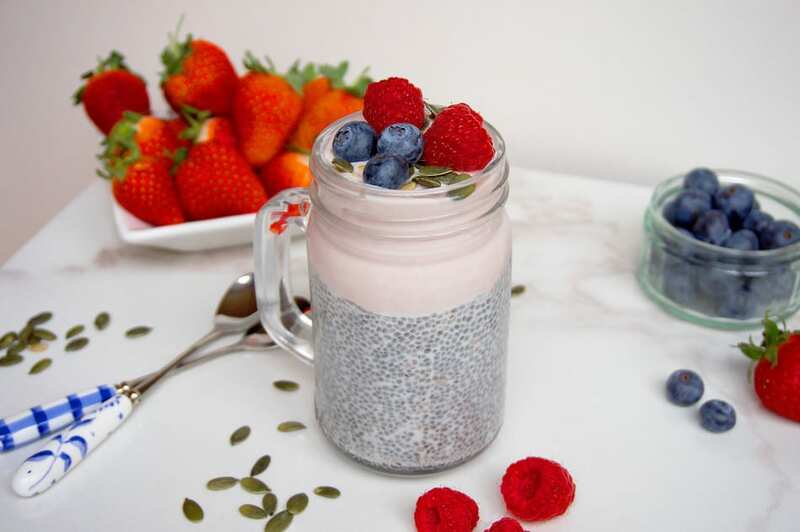 Come morning time you’ll be left with a deliciously sweet chia pudding that’s ready to be layered into a healthy and nutritious parfait that will take no longer than 2 minutes. 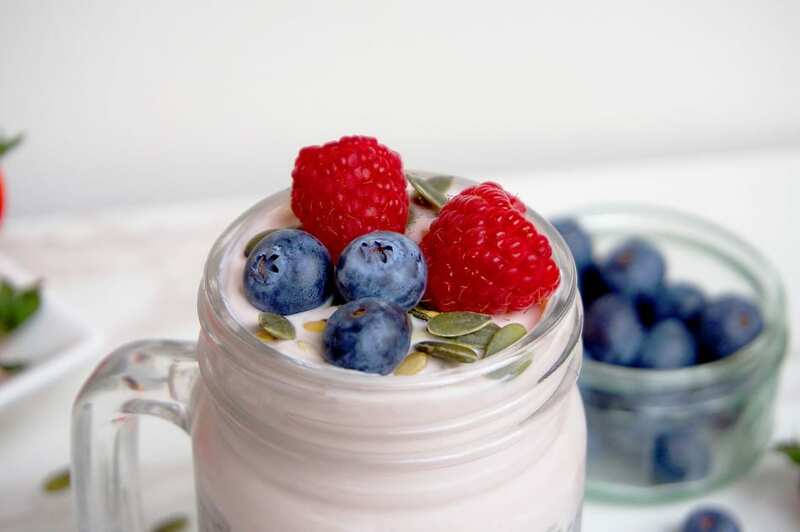 You’ll also have two options for the yoghurt part: to make it a high protein breakfast, simply add a scoop of organic WHEY protein powder and mix it together. Or if you’re not fussed in adding extra protein (the yoghurt and chia seeds will already contain protein), then simply top your chia pudding with the yoghurt mixed with açai powder and sprinkle on some seeds and a mix of raspberries, blueberries and strawberries. My favourite go-to fruit. A nutritious protein filled Primal Protein Acai Chia Parfait. This recipe is simple, quick and delicious. 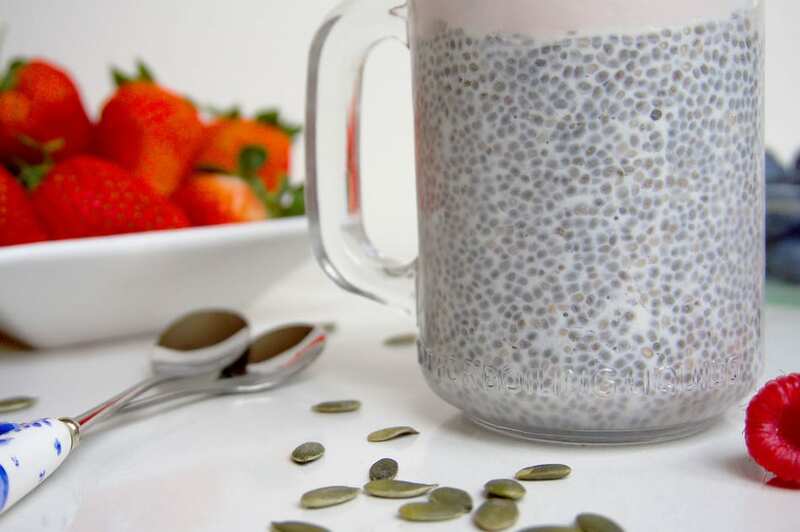 Begin by preparing the chia pudding overnight. Simply place all ingredients into a bowl, mix and leave in the fridge to set overnight or for a few hours. 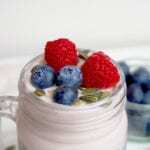 In the morning, simply pour the chia pudding into a jar. If you're having a protein yoghurt then simply mix together the WHEY, yoghurt and açai powder until combined and layer on top of the chia pudding (or have full fat yoghurt on it's own). Top your parfait with mixed seeds and a handful of berries. Enjoy!